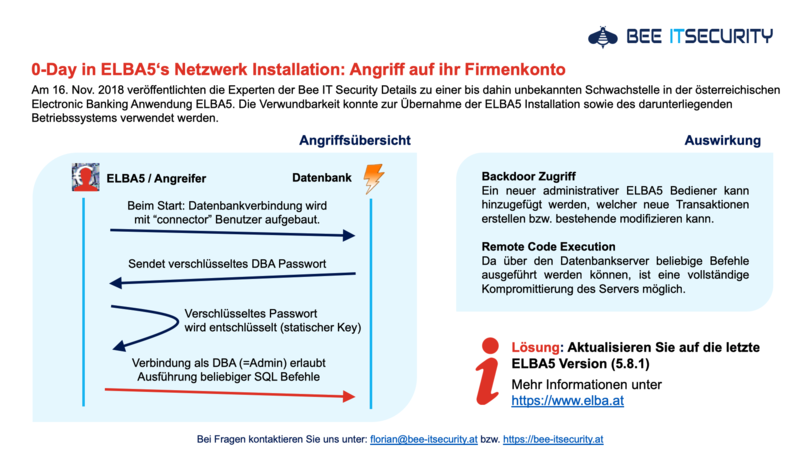 This blog post is about a previously unknown critical vulnerability in the Austrian electronic banking application ELBA5. 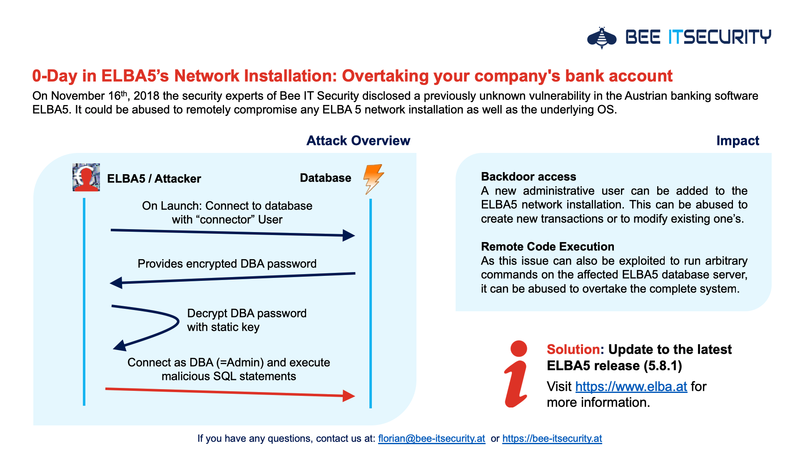 The issue discussed here could be abused to gain full control over any ELBA5 database server as well as the underlying operating system. It has a confirmed CVSSv3 score of 10.0. 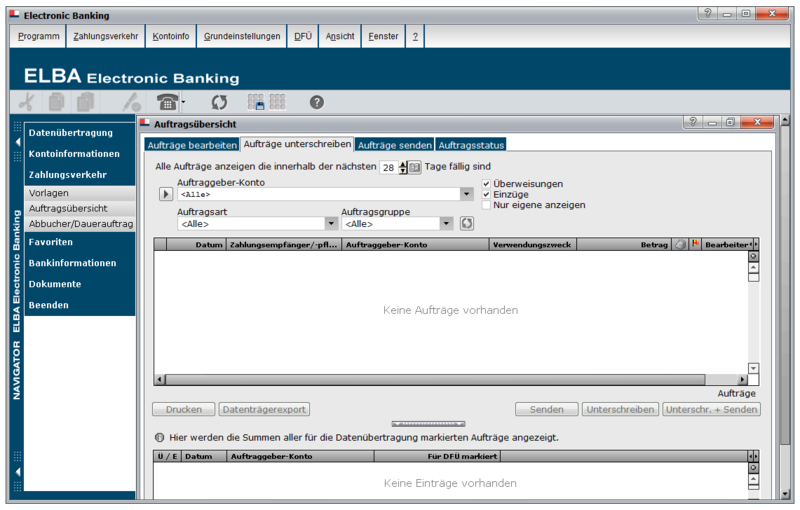 ELBA5, as shown below, is one of Austria’s most important business-focused electronic banking applications. It is used by the finance departments of many large organisations and supports about 24 different banks. It is important to note that there are two distinct ELBA5 releases, namely: ELBA5 single-seat and ELBA5 multi-user (aka network installation). The vulnerability discussed here is only exploitable for the ELBA5 network installation. However, I have also reported several other, although less critical issues for the single-seat release. So it’s highly recommended to updated to the latest version anyway. To give you a broad understanding of how the ELBA5 software stack works in a multi-user configuration, I create the following diagram. On the left side there is the ELBA5 server: This machine has two distinct functions: On the one hand it serves the ELBA5 binary application to all clients using a standard Windows file share. On the other hand it provides the ELBA5 backend, which is basically a SAP SQL Anywhere Database. The story of this vulnerability began during a penetration test last year. There I was able to gain access to the finance department’s terminal server. Amongst other’s they also used the ELBA5 network installation for their daily business. As I’m curious by nature I immediately launched all the interesting looking applications. Below is an image illustrating the sequence of things that happened right after. Can you spot the (possible) issue? Well, here is the thing that caused my attention: How is it possible to install automatic updates without any previous authentication? Is the ELBA5 application using hardcoded credentials to connect to the backend service? The 1 Million Dollar Question: How is this working in Detail? After taking a closer look at the privileges of the “connector” user on my debug machine (where I knew the DBA password), I discovered that this account is only authorised for a single column in a single table. Well, now I knew where the encrypted DBA password was stored. That it is encrypted (or at least obfuscated) was clear after I compared the content of the daten column with my known elba password. They were completely different. 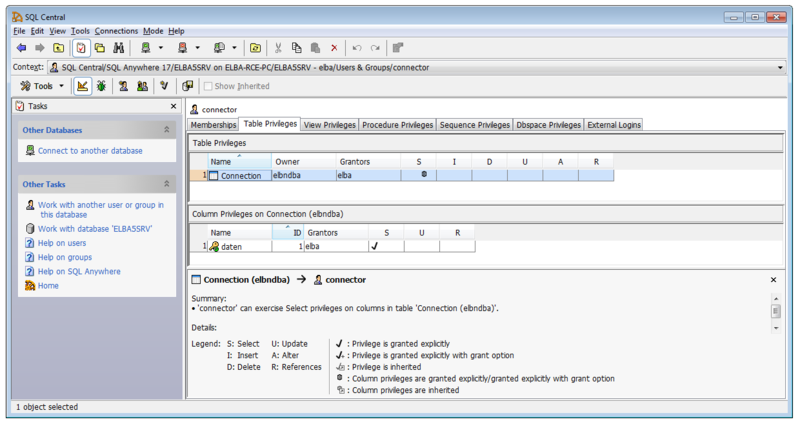 The highlighted SQL commands in the above screenshot are likely used to decrypt the secret elba DBA database password. Presumedly the AES encryption algorithm was used to secure the password. From the static strings alone however, I was not able to exfiltrate the required password. So I had to switch to something more dynamic: Immunity Debugger. After setting an access breakpoint on the memory addresses of the above strings (and a few hours of debugging), I found the following information on the stack. 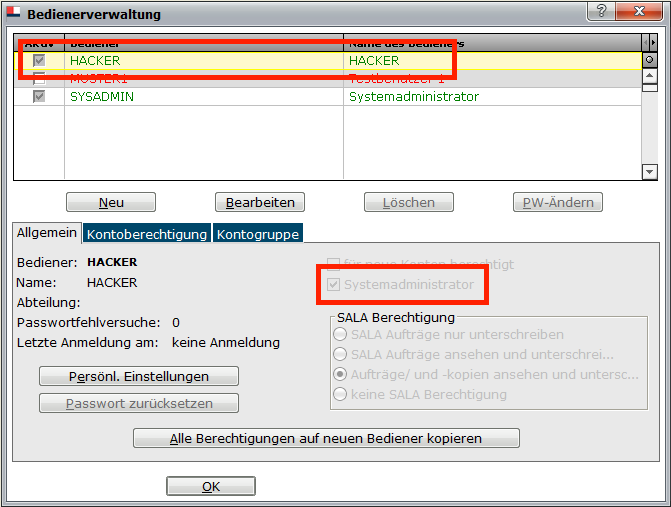 The highlighted part contains the hardcoded key that is used to decrypt the elba user’s password. 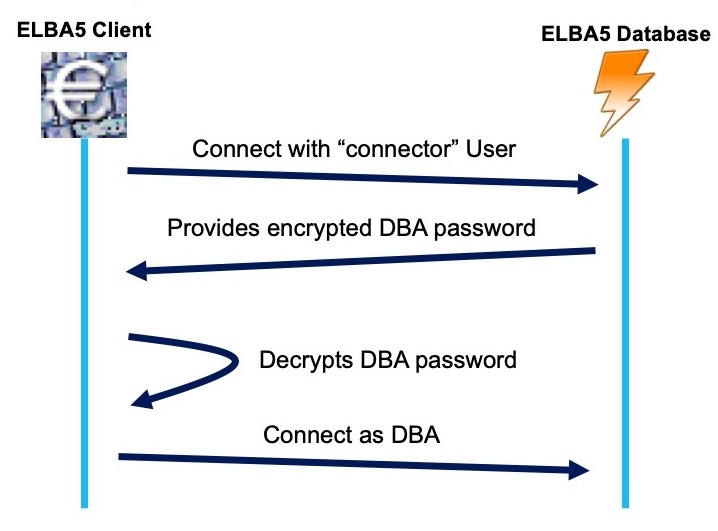 Connect to the database with the user elba and the decrypted password. We now have full control over all information that is stored in the DB. As I was targeting a banking application I thought it would be great to earn a bit of extra cash. So, what about adding a backdoor user? Because everyone wants to have a user called “HACKER” in this electronic backing application – Right? That means, we can also add a new Windows Admin. This give us full control over the affected server. Mimikatz anyone? To automate the process discussed in this blog post, I wrote a fully fledge python exploit. It can either be used to add a new ELBA5 user to the database or remotely run a command with SYSTEM permissions on the target system. The only thing that is required is that the ELBA5 SQL Anywhere Database service is running a vulnerable version and is accessible over the network (TCP port 2640). I also want to briefly discuss the coordinated public disclosure process that I went through with the developers of ELBA5. The initial issue was reported last year and triaged within days. As some may have already guessed, this is more an architectural issue and so it required intense rewrites and testing. I was invited twice during this process to discuss the current state. We openly talked about the risks and how they can be mitigated. I really want to everyone involved for how professionally this matter was resolved. Not many companies take IT security that serious. It really shows how they values their partners and endusers. THANK YOU! This coordinated process is also important for endusers. Why? Well, because the only thing they have to do is: Please install the lastest ELBA5 5.8.1 release from https://www.elba.at. A lot of testing went into making the transition to the new authentication module completely transparent. As I always think it is important to summaries the key aspect, I created the following overview. It gives a great high level introduction into the underlying vulnerability and the suggested solution. This slide is also available in German. If you have any questions, please contact me directly at florian@bee-itsecurity.at or use the comment form below. Für die meisten Unternehmen ist es undenkbar selbst “Malware Analyse” zu betreiben. Dennoch reichen oft schon wenige Tricks um relevante Eigenschaften einer Malware (sogenannte IOCs) zu finden. Über diese IP Adressen, Hostnamen, Dateien oder Registry Keys kann anschließend abgeleitet werden, ob und welche Endgeräte im eigenen Netzwerk infiziert wurden. Im folgenden Video stelle ich einige Methoden und Tools vor, wie auch Sie einfache Analysen selbst vornehmen können und so die Sicherheit in Ihrem Unternehmen mit eigener “Threat Intelligence” erhöhen. Autoruns – Welche Anwendungen werden beim Systemstart geladen? Due to the shortage of IPv4 addresses IPv6 has been developed. It is the successor protocol that will be used in parallel to IPv4 to drive the Internet’s underlying infrastructure. In this series of four blog posts I will give a general introduction to the most important aspects of IPv6 with a focus on the pen tester’s point of view. Be aware that this series is about the fundamentals and thereby does not cover all the dirty little details. 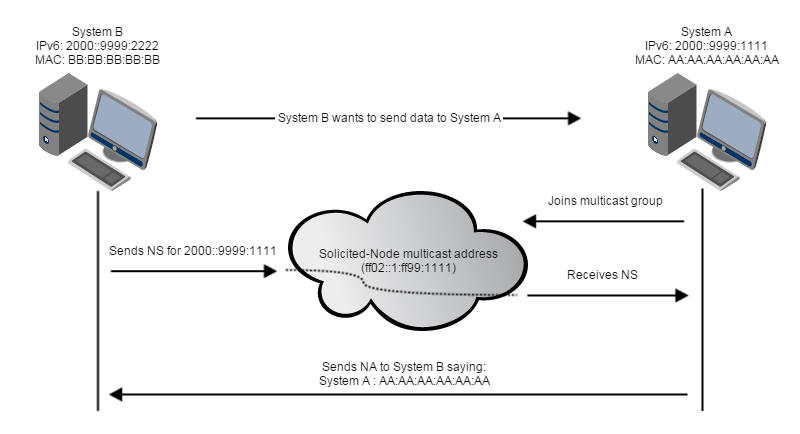 In part 1 we will cover IPv6 in general and how an IPv6 address look like. In this post we discussed some advantages of IPv6, how addresses look like and what tricks can be used to shorten them. 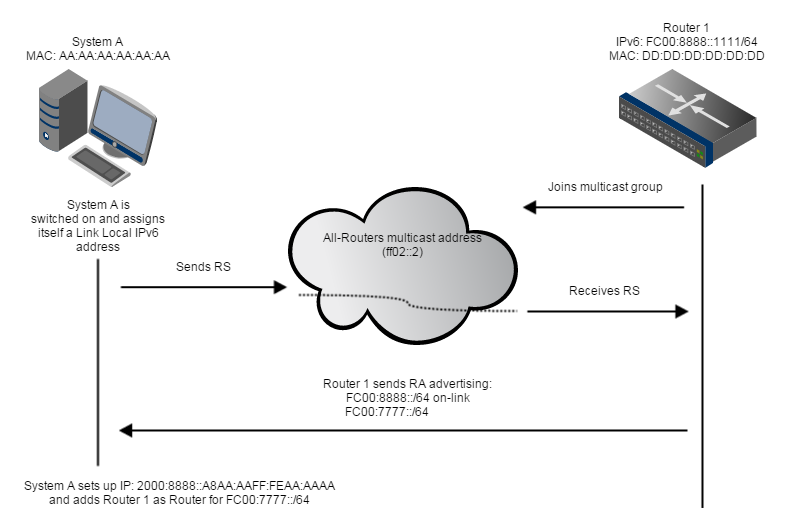 In the next one we will take a closer look at the different addresse types and IPv6 Link Local addresses.